Cate’s watercolors are inspired by years of sailing, canoeing, kayaking and fishing in the Lakes Region of New Hampshire and her annual visit to St. John in the US Virgin Islands. Her love for the lakes area began in childhood when she attended Camp Kehonka in Alton and learned how to sail. Her memories of Lake Winnipesaukee were embedded for life as she visited as often as she could, often staying at the family vacation home in Melvin Village. 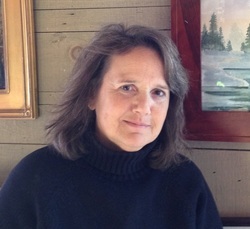 A few decades later, Cate moved to Wolfeboro and lives there year-round. She is active in the community and belongs to several arts organizations. Cate’s watercolor paintings are about capturing the beautiful landscapes of the New Hampshire Lakes Region and the US Virgin Island of St. John, and sharing them with others so that they can be reminded of their own time in these beautiful areas. Cate hopes her images conjure a sense of familiarity, connection, and joy. Where to See Cate's Art Work? Cate also sells directly to patrons. Click here if interested in any paintings in my portfolios.